Permaculture, organic food growing, alpacas, ponds, forest garden, wildlife, trees and bees, crafts and re-skilling, fresh air and friendship. To buy a gift voucher you will need to know which ticket types you want your vouchers to cover. Vouchers are available for individuals, couples and families with young children, you can buy these vouchers through the button below. Please click on the voucher on the product page for more information. If you are buying vouchers for several people you may need to buy more than one voucher, please click on the voucher to find out more and check that the ticket type is right for you. Please be aware that treks are unsuitable for buggies and the recipients must be fit enough to walk for an hour along rocky foot paths while leading a large animal. They will need sturdy walking shoes and warm clothes. Please be sure to provide the full name of your recipient(s) and the full name of the sender in the notes box in the payment system. You may also like to include a short message such as “Happy birthday from Auntie Jean” for the personalised voucher which we will email to you. When the recipient is ready they just need to book a trek online but instead of paying they will need to email us at info@hollyhagg.org.uk to let us know the voucher details and we will mark the trek as paid for. Gift vouchers are valid for one year. Our payment system accepts direct bank transfers and card payments through paypal. 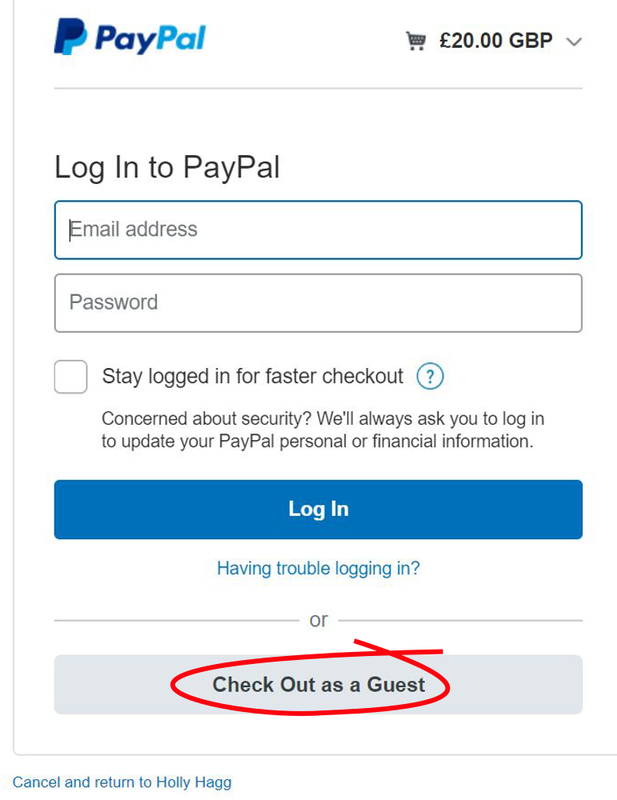 Please note, you can use paypal even if you don’t have a paypal account, just log in as a guest using the ‘Check Out as a Guest’ button at the bottom of the paypal payment screen (shown in the image to the right). If you want to pay by cash or cheque please contact the Holly Hagg team at info@hollyhagg.org.uk to arrange payment. Holly Hagg is a not-for-profit company limited by guarantee without share capital.